This story of “Black Dave” explores the psychological motivations for Hunter’s major decisions and analyzes his strategy as he traveled and burned much of the Virginia Valleys. With mastery and vivid detail, Walker brings Hunter’s campaign to life—from the smell of the burning homes to the fear of the soldiers in battle. Hunter’s Fiery Raid Through Virginia Valleys is the only detailed and accurate account of David Hunter’s savage assault on Confederate military forces and the Southern civilian population. Ikwa is a young Indian girl living in the Southeastern United States before colonization. One day, as she carries an offering up the temple mound to the priest of the sun god, she spies two crows and a hawk flying toward the Alligator village—a sign that a strange visitor will soon come. Whether the stranger would bring joy or sorrow to Ikwa, her brother, Situ, and the rest of the family, the gods did not yet choose to say. Through the private letters, written testimonies, and journal entries of hundreds of Confederate officers, Mauriel Phillips Joslyn provides a moving and heartbreaking account of the six hundred Confederate soldiers who suffered in Union custody. After Lincoln and his war council dissolved the prisoner exchange program in 1864, the North used captured officers from all states in the seceded South to set an example to the remaining Confederacy. The Indians of Lousiana represent one of the state’s most fascinating stories. Proud, industrious, and resourceful, the various tribes have left their imprint in a variety of ways. One finds links to these old cultures simply by taking notice of some of Louisiana’s place names—Houma, Caddo, Atakapas, Natchitoches, Tangipahao, Bayougoula, and Uochita are but a few examples. But the story of Louisiana’s Indians isn’t limited to names. Hardcover. Beginning in ancient times, symbols of luck (four-leaf clover) and faith (Celtic Cross) established themselves in the Irish culture and have survived for centuries. The country’s rich history extends from the Rock of Dunamase and Kilkenny Castle to the legends of St. Patrick and Finn MacCool. 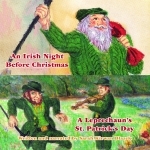 Two stories for the Irish, or the Irish at heart! ’Round Christmastime, things are a little different on the Emerald Isle. Father Christmas with his Irish eyes twinkling ushers in his seven elves, to enjoy the poteen and plum pudding and unpack his large sack. And thus begins the wondrous Irish Night Before Christmas. And Who could add to the merriment of St. Patrick’s Day more than leprechauns? When they make up their minds, they are determined to make mischief . . . and that is just what they do in A Leprechaun’s St. Patrick’s Day. Dublin’s St. Patrick’s Day Parade will never be the same! Sarah Kirwan Blazek, narrator and author, was born in County Wexford, Ireland, and retains dual citizenship in Ireland and the United States. Her delightful brogue perfectly complements the stories on this CD. A former teacher at the Academy of the Sacred Heart for Girls/Hardey Preparatory for Boys, Blazek lives in Chicago, Illinois. Written in an Irish brogue, this delightful children’s story tells the classic “’Twas the Night Before Christmas” tale with a Celtic twist. Complete with James Rice’s illustrations, this fun and festive coloring book inspires kids to use their imaginations. Irish Poems will both enchant and delight the reader with expressive lilting verses that capture the essence of Ireland over the past few centuries. It is beautifully illustrated with charming depictions of wee leprechauns and Irish folk. Regarded by many as the “Mother of Texas,” Jane Wilkinson Long is curiously absent from most history books. Now, this painstakingly researched novelization reveals the fascinating life of the little girl who would grow up to become both a spy and revolutionary in Texas’s fight for independence from Mexico. Today, hundreds of thousands of people swarm to the New Orleans Fairgrounds to experience the cornucopia of culture that is the world-famous New Orleans Jazz & Heritage Festival. Who could imagine that at the very first Jazz Fest, the musicians and volunteers outnumbered the members of the audience by about six to one?